4 Wheels - Road Tuning. 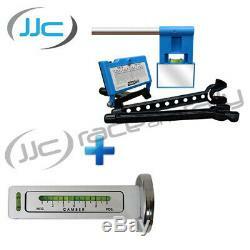 Trackace Laser Wheel Alignment / Tracking Kit + Trackrite Camber + Caster Gauge. Trackace is the World's first auto-calibrating, laser accurate tracking gauge. The Trackace unit is designed to be used in a home environment with simple storage. Trackace comes in a storage case, approx 75 x 19 x 4cm, perfect for the shelf in the garage. Having the unit readily available means it is perfect for your road car or setting up your competition car before a race or track day. Obviously one of the main concerns with any diagnostic equipment is accuracy. Accurate to 1' (0.0166 decimal degree). The trackace uses a simple two stage process which utilises a single reversible gauge, placed consecutively on each wheel. Calibration of the Trackace unit is automatic, as it is incorporated into the checking process. This system means calibration is ensured for every use and is also over a distance of approximately 8 feet (laser travel of approx 16 feet at calibration). The only laser triangulating apparatus that calibrates at a greater distance than its operating distance. Wheel alignment can be easily knocked out, especially on roads that are poorly maintained. Thanks to the clever people at Trackace all these problems can be avoided and you can save yourself some pennies! The Trackace auto-calibrating laser alignment gauge comes at a price everyone can afford. Having this unit available in your home garage means regular checks can be performed and you can be alerted to any wheel alignment changes before any larger issues start to set in. Patent pending features allow the gauge to auto-calibrate to each vehicle straight from the box, so you can expect accurate results every time. Gunson Trakrite magnetic camber and castor gauge measures the Camber and Caster angle on the wheel hub or brake disc and allows adjustment to maintain correct wheel alignment and even tyre wear. Camber is defined as the inward or outward tilt of a wheel at the top relative to the vertical position. The Caster angle is the angle between the vertical and the inclination of the king pin when viewed from the side of the wheel. Picture purely for illustration purposes only. Trackace requires 2 x AAA batteries (batteries not included). Fits 10" - 22" Wheel Sizes. Any subsequent orders can be delivered to an alternative address. ORDER NOTES - Due to the automated system we operate, we cannot guarantee to be able to view any notes or comments you add to your order. OVERSEAS ORDERS - Please be aware that we are unable to alter the value or description marked on orders destined overseas for the purposes of avoiding having to pay duty on your order. LISTING IMAGES - In most cases, the images used on our listings are generic and for illustration purposes only. Please ensure you read the listing title and description for an accurate summary of what is included in the listing. We are putting the'customer' back into'Customer Service'. Our shop is designed to be fast, clear and easy to use. However, we want you to be confident that if you have any questions or queries regarding any of our listings, our dedicated team of experts are at the other end of a telephone or keyboard waiting to help. Express and guaranteed services will need to be selected and paid for at time of ordering. At JJC, we strive to keep feedback 100% positive. We do this by offering quality products and 1st class customer service. Our customers satisfaction is the most important thing to us at JJC. BOX 2333, Kencourt T/A JJC Race and Rally, Wrexham, LL11 0HB. The item "Trackace Laser Wheel Alignment / Tracking Kit + Trackrite Camber + Caster Gauge" is in sale since Friday, August 8, 2014. This item is in the category "Vehicle Parts & Accessories\Car Wheels, Tyres & Trims\Pressure Monitoring Systems". The seller is "jjcraceandrally" and is located in Wrexham.